DC Cross Flow Fans On Pelonis Technologies, Inc.
145mm (5.7in) to 347mm (13.7in) lengths. DC Brushless type motor, temperature resistant aluminum alloy, ball or sleeve bearings. Maximum Pressure: 1.5mmAq (0.059inH2O) to 1.9mmAq (0.074inH2O), Maximum Air Flow: 21CFM (0.6m3/min) to 49CFM (1.3m3/min). CE, UL listed. Rated Voltage: 24 or 48 Volts. DC Brushless type motor, temperature resistant aluminum alloy, ball or sleeve bearings. Maximum Pressure: 9.8mmAq (0.385inH2O), Maximum Air Flow: 265CFM (7.5m3/min). 324mm (12.8in) to 360mm (14.2in) lengths. DC Brushless type motor, temperature resistant aluminum alloy, ball or sleeve bearings. Maximum Pressure: 1.0mmAq (0.039inH2O) to 1.1mmAq (0.043inH2O), Maximum Air Flow: 67CFM (1.9m3/min) to 74CFM (2.1m3/min). CE listed. 155mm (6.1in) to 420mm (16.5in) lengths. DC Brushless type motor, temperature resistant aluminum alloy, ball or sleeve bearings. Maximum Pressure: 2.6mmAq (0.102inH2O) to 4.0mmAq (0.157inH2O), Maximum Air Flow: 32CFM (0.9m3/min) to 131CFM (3.7m3/min). CE listed. 183mm (7.2in) to 489mm (19.3in) lengths. DC Brushless type motor, temperature resistant aluminum alloy, ball or sleeve bearings. Maximum Pressure: 1.7mmAq (0.066inH2O) to 5.1mmAq (0.200inH2O), Maximum Air Flow: 60CFM (1.7m3/min) to 156CFM (4.4m3/min). CE listed. 185mm (7.3in) to 425mm (16.7in) lengths. DC Brushless type motor, temperature resistant aluminum alloy, ball or sleeve bearings. Maximum Pressure: 2.5mmAq (0.098inH2O) to 6.3mmAq (0.248inH2O), Maximum Air Flow: 71CFM (2.0m3/min) to 149CFM (4.2m3/min). CE listed. 485mm (19.1in) to 665mm (26.2in) lengths. DC Brushless type motor, temperature resistant aluminum alloy, ball or sleeve bearings. Maximum Pressure: 1.9mmAq (0.074inH2O), Maximum Air Flow: 166CFM (4.7m3/min) to 212CFM (6.0m3/min). CE listed. Cross flow fans — sometimes known as tangential fans or, less commonly, tubular fans — are highly specialized products. They are essentially centrifugal fans, featuring curved or inclined radial blades that have been elongated. Cross flow fans are most notable for the wide, uniform airflow they generate, which axial and radial standard fans and blowers are incapable of. Also, cross flow fans’ rectangular housings and their ability to provide right-angle airflow allow for use in tight spaces, like corners. Thanks to their specialized features, cross flow fans are often employed in unique applications. The most common uses include: cooling and drying applications, often in conveyor belt scenarios; large-scale circuit board cooling; a range of heating, ventilation, and air conditioning (HVAC) applications; and air curtain applications. 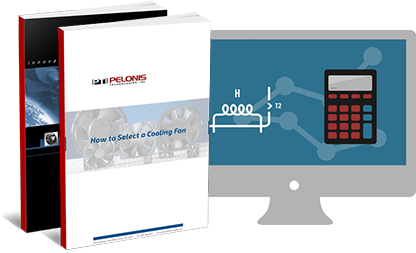 Pelonis Technologies, Inc. (PTI) offers a variety of cross flow fans, including AC, brushless DC, and high-efficiency Electronically Commutated (EC) varieties. Naturally a low-noise fan, brushless DC motor cross flow fans operate even more quietly than traditional fans. UL and CE listed, cross flow fans from PTI are available in numerous lengths and static pressures to suit a wide variety of applications. To learn more about cross flow fans from PTI, view our product catalog below or a contact us today. 185mm (7.3in) to 485mm (19.1in) lengths. DC Brushless type motor, temperature resistant aluminum alloy, ball or sleeve bearings. Maximum Pressure: 2.7mmAq (0.106inH2O) to 8.2mmAq (0.322inH2O), Maximum Air Flow: 81CFM (2.3m3/min) to 191CFM (5.4m3/min). CE listed. 512mm (20.2in) to 792mm (31.2in) lengths. DC Brushless type motor, temperature resistant aluminum alloy, ball or sleeve bearings. Maximum Pressure: 3.0mmAq (0.118inH2O) to 3.9mmAq (0.153inH2O), Maximum Air Flow: 282CFM (8.0m3/min) to 469CFM (13.3m3/min). 503mm (19.8in) to 783mm (30.8in) lengths. DC Brushless type motor, temperature resistant aluminum alloy, ball or sleeve bearings. Maximum Pressure: 1.3mmAq (0.051inH2O) to 1.7mmAq (0.066inH2O), Maximum Air Flow: 243CFM (6.9m3/min) to 423CFM (12.0m3/min).